Cristiano Ronaldo scored late on for Juventus against minnows Frosinone to forget all about his tears in Valencia. The 33-year-old left the field crying after he was harshly shown a red card during Juve’s Champions League clash in the Spanish city in the week. 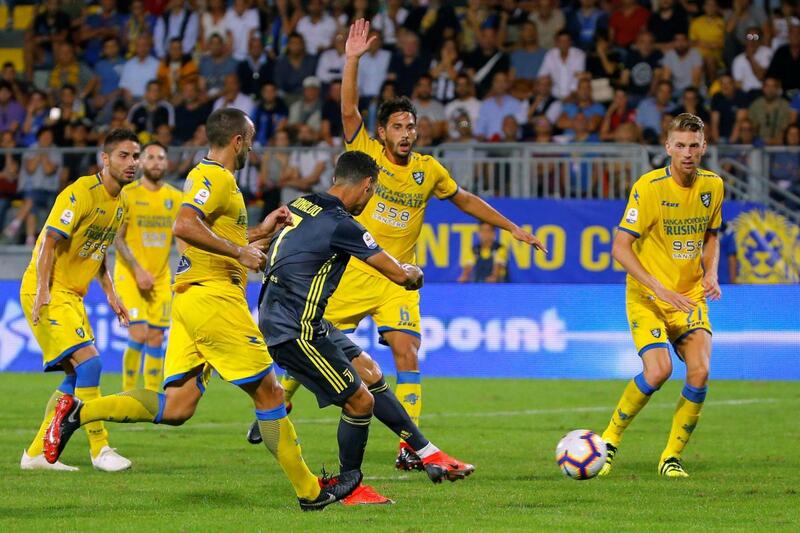 But it was back to business for the £99million summer signing from Real Madrid as he scored a scuffed effort to break Frosinone hearts in the 81st minute. Pjanic’s shot was blocked by a defender and the ricochet fell straight to the former Manchester United man who slotted it past Sportiello calmly. There was some argument that Ronaldo was in an offside position, but the linesman’s flag stayed down, and the referee chose not to use VAR. Juve, who dominated possession but were poor in the final third, added some gloss to the scoreline in the fourth minute of injury time. Ronaldo won the ball in his own penalty area and brought it to the opposite end of the pitch before laying it off for Pjanic. The central midfielder looked up and found Federico Bernardeschi in space who took his chance with a curling effort that beat Sportiello. Against Valencia, Ronaldo left the pitch in tears after seeing red for an off-the-ball incident with Jeison Murillo. He will definitely miss Juventus’ clash with Young Boys on October 2 but faces sitting out of up to three games of this year’s competition. And that would mean the Portuguese striker, 33, would be absent for the match at Old Trafford on October 23 and the return in Turin on November 7. The five-time Ballon d’Or winner was given the marching orders for the 11th time in his career and walked off sobbing.